This simple composition in a limited space is flanked by the allegorical figures are of Charity and Justice. The allegorical figure of Charity is considered a masterpiece in this series. 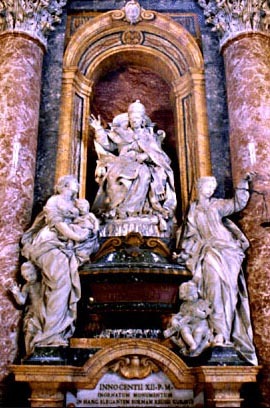 The Monument to Pope Innocent XII (1691-1700) by Filippo Della Valle, has a simple composition - an urn is surmounted by a statue of the Pope, flanked by the allegorical figures of Charity and Justice and crowned at the top by two angels which support the coat of arms - but with a greater height development, due to the restricted space. For this reason, despite the good harmony of the arrangement, the monument-like effect is inevitably sacrificed. The Pope is portrayed seated, with the "Triregno" on his head and his right hand in the act of blessing, with a peaceful pose, but not adequately communicative. The figure of Charity is more successful, and can be considered to be a masterpiece in the long series of female allegories in the Basilica. This is the result of the lyrical and vital interpretation of maternal love as well as the sincere and non-emphatic expressive effect that are delicately modeled. This mother clutching the sleeping child to her breast does in effect pay due respect to the charitable conduct of Pope Innocent XII, who was always humble and solicitous toward the poor. The other figure of Justice, with the sword and the scale, with just as beautiful but a more melancholy and almost graceful expression, alludes to the solicitude pursued during the Pope's administration, who for such a purpose created the Innocent Curia at Montecitorio, which today is the site of the Italian Parliament. These two noble figures rest on a base of antique green marble and flank a richly decorated urn with a plinth of rare breccia of seven bases: two marble insertions which, together with those described, create the attractive multi-colored arrangement of this monument. Innocent XII was a reformist pope in the style of his hero Innocent XI, striking especially at nepotism. The new pope introduced economies in the administration of Rome and the Papal States, reformed the judicial system, insisted on impartial justice for everyone, reduced (but did not eliminate) the sale of church offices, established the Hospital of San Michele for poor youths, opened the Lateran Palace as a refuge for disabled people unable to work, and declared that all of the poor and the needy were his "nephews." His most significant initiative was his decree Romanum decet pontificem (June 22, 1692), which mandated that popes may never grant estates, offices, or revenues to relatives and that if such relatives are poor, they should be treated like others in need.